Back in the day, before I cared so much about the food I put into my body – in those dark days when being skinny was the primary goal and high-carb, low-fat was the way to go – one of my favorite “I don’t feel like cooking” meals was a bowl of spaghetti with a little olive oil and parmesan cheese with a few (fat free) breadcrumbs sprinkled on top. It could be throw together in about 20 minutes, and it was comforting and unchallenging in its simple familiarity. I suspect it would taste like paste in my mouth if I tried it now, but I miss that feeling – the experience of a warm, comforting bowl of food that can be slurped or twirled with a fork to make big, soft, round bites… the kind of food you make while wearing pajamas, unplugged from the rest of the world, potentially about to be joined by a snuggly cat in losing yourself in an excellent book. Tonight, I figured out how to recreate that experience – pajamas, cat, and all – without sacrificing my health. Zucchini noodles stand in for the pasta and gently-cooked eggs add just the right texture to take the place of the parmesan, while adding a healthy dose of essential protein. I even satisfied the indulgent part and made a slight sprinkling of almond meal “bread crumbs” for the top. 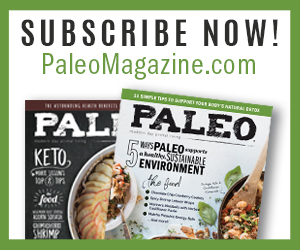 And lest you worry that all this paleo food business takes longer to prepare than the conventional stuff, the prep and cook time clocked in at 25 minutes – and only about 5 of that was actual work. Trust me: this does not taste like a big bowl of zucchini. The garlic and olive oil transform this dish so it tastes like neither vegetables nor eggs, but some miraculous, noodle-y merging of the two. It’s warm and tender and scrumptious. A hug in a bowl. Replace the zucchini with a head of riced cauliflower to make Comfort Rice! Break the cauliflower into florets, removing the stems. Place the florets in the food processor bowl and pulse until the cauliflower looks like rice, about 10 pulses. Heat a skillet over medium-high heat, then add the 1/2 teaspoon coconut oil/ghee/olive oil, the cauliflower, and 1 teaspoon salt. Toss to coat the cauliflower with the oil. Cover the skillet, reduce the heat to low, and cook until the cauliflower is tender, about 5 minutes. Then follow the remaining instructions above. So, if I don’t have almond flour, will coconut flour work? No, coconut flour won’t work. If you don’t have almond flour, I recommend that you skip the ‘breadcrumbs’ part of the recipe. That really only words with nut flour. Jos…can you post the recipe for flaxseed almond butter please! This dish looks absolutely delicious. I have a zucchini noodle post prepared later for this week as well. I am continually amazed at how well zucchini stands up. I’m excited to try this out and so loved your writing on this post. Super comforting, just like the dish. You just made my day — thanks for the tasty words about my writing. I was slurping the noodles while I typed, so I guess I have to give credit to the zucchini. keep up the good work with some spice! Can I sub coconut flour for almond?? I have a ton of allergies but this sounds soooo good! Thanks! I don’t eat nuts either, but I toast shredded coconut with salt instead of almonds and think it works really nice with this dish. I cannot wait to try this. As a fellow ‘foodie’ I so get the whole comfort thing. In fact, I used to tuck into smoked gouda mac n cheese when I needed a hug in a bowl! Also I luuuurrrrvveee the way you write…quirky and you have your own language sometimes. Adore! Thanks, Kelly! I love to make up words… and talk to Smudge while I do it, so I’m pretty sure that makes me, be definition, the crazy cat lady. Love your blog. We love zucchini noodles. We make them with the Spirooli. Essentially it works like an apple peeling machine and creates spaghetti type noodles from zucchini. You for sure will never want pasta again. Great way to get veggies into the kids. I just got a Spirooli and don’t know how I have lived without it. I usually used a julienne peeler for a dish like this, but cannot believe the difference in mouth feel from the Spirooli. I will definitely try this recipe- never thought of adding the eggs. Thanks! I loooove zucchini and I have no idea why I never payed attention to it before going paleo.. I never bought it before, now it is a stable part of my shopping list! Going to my first farmers market ever tomorrow, hoping I will buy a few there and make this! 🙂 Thanks for sharing Mel! I once had an hour-long argument with a friend that insisted zucchini had no flavor. I kept saying it was delicious, and he refused to concede the point. Have fun at the farmer’s market! I don’t think zucchini has much taste, but that’s exactly what I like about it for savory dishes like this. It carries delicious sauces without interfering with the flavor. I’ve been do dissatisfied with spaghetti squash because it tastes too darn sweet to me. I really hate sweet mixed with savory, so it’s just yuck! Have been so glad to discover zoodles for this purpose instead! I just tried making zucchini noodles for the first time this week after reading about it on nomnompaleo. I was so impressed by how easy it was to do with the julienne peeler, and how great the texture and taste was. I would definitely recommend it! The julienne peeler is such a nifty trick! And the salting/sweating makes a HUGE difference in the texture and taste. Totally worth the extra 20 minutes. Zucchini noodles are the best thing *ever*! Thank you for the fab comfort food recommendation. I discovered a new Penzey’s blend: Singapore Seasoning. Have you tried it? Doesn’t get much easier than that. It wasn’t terribly spicy-hot, either. If you want extra oomph, add some Sriracha (or similar). Thanks for the tip on Singapore Seasoning. I haven’t tried it yet — but now I will! And yeah, this is pretty much amazingly awesome comfort food. Perfect for PMS or recovering from a cold or flu. My mom is from Germany and every year we have a dish called rouladen for Christmas (it’s thin steaks wrapped around bacon, onions & pickles- paleo-friendly other than the accompanying gravy), but it’s served with noodles topped with fried breadcrumbs- now I can have this instead, yay! Um, rouladen sounds AWESOME! And yes, these would be so great alongside! You might try making gravy for yourself with a little arrowroot — according to M&D of the Whole9, it’s OK to use arrowroot because it doesn’t include anti-nutrients and it’s used in such small quantities. Shoot me an email or post here if you want more details on how to use it. Yeah good idea! I’ve played with arrowroot a little bit but never know how much to use; a little bit seems to go a long way. I’ll need to write up a rouladen recipe soon- it’s such a great fall/winter dish! Sweet! I was wondering about arrowroot just a couple days ago. Would love to make paleo sausage gravy at some point. Would that be weird with coconut milk? I use this sausage gravy recipe with coconut milk and arrowroot. I like it better than normal gravy! 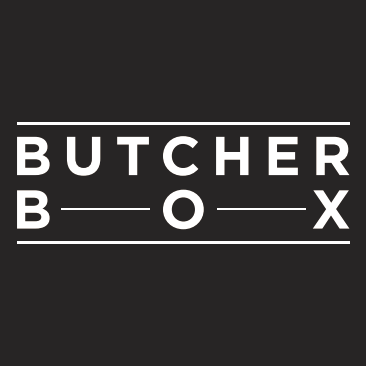 :http://crossfitrebellion.com/paleo-biscuits-gravy/ never tried the biscuits there, they look terrible, but the gravy is A+ 🙂 Too bad this comment is a year late, hope you see it! YUM. that sounds awesome. bookmarking this recipe!!! Hi, Terri! How’s your “special project” going?! Newbie to your site and absolutely adore it. Love your recipes as well…did I read somewhere you were writing a cookbook? I sincerely hope so. I picked up the ingredients for a couple of recipes from my foray to your site last week – my way of hunting/gathering I guess. Going to have to add this to my list of things to try. For all the very same reasons. Thank you! Welcome, Amy! I’m glad you found me that you’re enjoying my blog. And YES! I’m working on a cookbook right now. It will be released in early December, and I’m super excited about it. There are a bunch of new recipes, and some favorites from my site, completely re-tested, re-written, and tasting even better. I’ll be sharing my news about the cookbook in September. Til then, happy cooking and keep us posted on how you’re doing! awesome recipe! i’m eating it as i type. this came at the perfect time as i am a gluten-free eater currently on a low-iodine diet for an upcoming thyroid scan. i followed the recipe minus the salt and egg yolks then added some basil and tomato from my garden. delish! thank you! Your mods sound delicious, Shannon. Good luck with the thyroid. I have thyroid stuff, too, and it’s less than fun. Thanks for commenting! Oh, poor you! Hope you’re feeling better. I am totally trying this this weekend! Last week I needed a hug in a bowl and did make zucchini noodles and threw in some leftover pesto (no cheese, still yummy)with a few walnuts and that, too, was really comforting. Can’t wait for your cookbook!! You are so sweet — thanks! I can’t wait for my cookbook, too! Zucchini noodles with pesto are the BOMB! Especially now that I learned that “sweating” trick. Last time I made zuch+pesto, it got all watery, and I was so sad. But now: happy! YAY! I made you shout-type in all caps. UUUUUMMMMMM-UUUUMMMMMM!!!! I’ve got a belly full of delicious comfort noodles! They were really good. My only change for next time is to make double so I can eat two bowls full!!! (Which I think you could do without increasing the eggs, no?). I added some red pepper flakes for the second half of the bowl but GREAT either way! New to your blog and love it! Keep up the great work! Glad you liked it! And yeah, you can totally increase the zucchini without upping the amount of eggs. For a girl around my size, 3 eggs is a good serving of protein, so adjust accordingly if you’re taller or more muscular. And you really can’t overeat zucchini, so go for it! Yum. You are wonderful. I made this tonight, albeit with zucchini ribbons ‘stead of noodles (I gotta get that julienne peeler!) and toasted coconut flour, not almond flour, although almond would have been better – I was out. Thanks for a comforting recipe – perfect for a rainy fall-ish day when all I wanted was popcorn or hot cocoa. Yay for rainy-day comfort food. I bet the ribbons were great — like linguine! This was phenomenal! I made it this morning for breakfast with some leftover coffee/spiced steak. The zucchini had a perfect tender/firmness ratio. Come on, people! With zucchini and spaghetti squash, who needs the old crap? Fantastic. Glad to know you liked it — and your steak sounds great! My DH will not eat spaghetti squash in place of pasta because he doesn’t like that it’s watery. Will the sweating thing work on spaghetti squash as well? I was just thinking to myself, jeez, it would be so nice to eat pasta tonight because it’s so easy…but I so don’t want to eat junk pasta. This is perfect! I’m cooking it immediately! Hope this satisfied your craving, Krista! That’s an awesome idea! Thanks for sharing. Wow! This looks so great! (will large, older zukes work?) I just found your site today and I’ve been glued to it for a couple hours. Your recipes sound so great and yet so simple and basic. 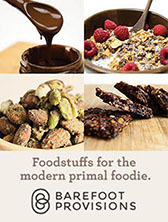 Finding recipes that will satisfy our comfort needs is helping us commit more to primal/paleo type eating. We’re gearing up for W30 after Thanksgiving to help us stay clean and healthy through the holidays. And maybe a GAPS Intro for good measure when we get through. Thanks for the help! I think this would be an excellent way to use up large and /or old zucchini. TOTALLY! Glad you found me — and best wishes for an awesome Whole30 experience. Keep us posted on how you’re doing. I’m new to paleo, and had saved this recipe. It was absolutely fantastic! I added red pepper flakes and curry to the second half of the recipe, added half a chicken breast and a handful of shrimp (tailless) to the final sauté for a spicy curried Singapore mei fun I had been missing beyond belief! I also toasted grated dried coconut because I didn’t have almond flour, and it was great with the Asian variation. This recipe can have so many variations, though the original recipe needs no improvement. Thank you so much, and I look forward to trying more of your unbelievably delicious creations!!! Glad you had fun customizing the recipe — your mods (esp. the coconut!) sound yummy! Tried these tonight (slight mods) and can’t wait to go to bed, just so I can wake up and make them again for my breakfast!! I have a question please and forgive me if I’m sounding a little clueless here… How come the zucchini noodles get rinsed after salting/resting step? Aren’t we trying to remove the water so why do we rinse? Hi, Heidi! Glad you like the noodles! I rinse mine because I salt them really generously, and I didn’t want them to be too salty. If you’re OK with not rinsing, that’s great — you can save a step! Man i just made these and i think i used too much salt to “dewater” the zucchini… I even rinsed and dried them twice because they tasted too salty the first time…oh the lessons you learn cooking! Will definitely try them again though. Oops! I haven’t oversalted yet… next time I make them, I’ll measure my salt and update the recipe. Served it up in my ridiculously oversized Looney Tunes mug that my mom gave me when I was sick in college. Truly a hug in a mug. Sending a virtual hug, too 🙂 Hope you’re feeling better soon! I’ve had this three times now! Then I ran out of eggs. Oh no! I look too much like death to go get some. Now what? You inspired me to put on my own “Whole30 hat” and make up my a noodle dish with ingredients that I had on hand – zucchini noodles with pumpkin meat sauce. Needs tweaking, but it was fun to create! Reading your blog makes “kitchen creationism” much less daunting. Thank you! Just made this for dinner. Cheated a bit and added a couple cubes of feta :-/ absolutely delish! Great winter warmer! Um… O.M.G. This is SO good! It’s sitting in my lap right now and I had to type this before I ate another bite. Mel, you’re amazing! Btw, I added a little bit of coconut aminos to it too bc it reminded me a bit of the pad thai. Tastes yummy! Thanks for helping me continue to be a Well Fed, Paleo girl! I omit the topping,truth be told. Lazy. Love the taste of the noodles and eggs so don’t feel likei am missing out. Breakfast, lunch, and dinner – I’ve had this recipe or all three meals and really,just typing this comment makes me want to add bedtime snack to that list. Using a veg peeler to give wide ribbons…just bought an actual julienne peeler this afternoon. 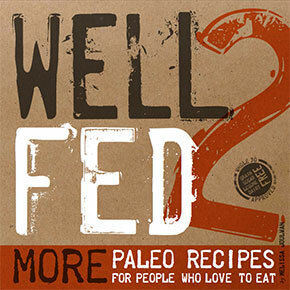 Read on Nom Bom Paleo’s blog she skips the sweating and instead nukes the noodles 2 min. Tried it today – ok and faster, yes, but your sweating technique made for a truly noodle-tasting nirvana. The topping is an accessory, for pleasure only. Doesn’t add much nutritionally, so good for you for leaving it out. Have fun with the julienne peeler — and yeah, I agree: the sweating step is worth it. Making this on Thursday….can’t wait. AWESOME blog post. Thank you! So glad you liked them! Wow! These noodles TOTALLY hit the spot. Thank you! I am looking forward to my Well Fed cookbook copy to get here! First time to be introduced to you Mel. Love the whole movement of the best food! Have been working on it for about 10 years and it has felt kinda lonely until recently when more people have found their way here. GO MEL! LOVED YOUR ZUCCHINI NOODLE RECIPE! I used eggplant similarly. Sliced rounds 1/4″ thin, olive oiled & salted them. Laid them out on two baking sheets. Roasted for 20 minutes at 400. Turned halfway through and made lasagna. RAVES!!! I will be YOUR devotee now. This is a lovely comment. YAY! Thanks for the eggplant tip. This is THE best paleo dish that I’ve had since I started 3 weeks ago. Every night for the past 2 weeks I have made something out of your book, and every time I’m like, “Holy crap, this is fantastic!” But this just hits the spot oh so well. I think I need to ALWAYS have zucchini at hand for this. Cool! Glad you like it. It’s pretty nutso how well the zucchini works, isn’t it?! I always keep some in my fridge for when I have noodle emergencies! Thank you so much for sharing this wonderful idea! It hit the spot since one of my biggest problems is missing pasta. I can see this being very versatile, too. YUM! just made them. I didn’t have any almond flour, so I ran some pine nuts through the food processor and toasted them! It was AWESOME! Thanks! Can’t wait to try this recipe!! Sounds delicious! Found this recipe through Pinterest, and I really enjoyed it! I’d never thought of “sweating” the zucchini noodles before – it blows my former-pasta-loving mind! There was a bit too much egg for my taste, but I’ll adapt it for me-quantities next time. I’m doing the SCD, not strict paleo, so I added parmesan on top and scrambled the eggs with cream, and it was extra-decadent and so tasty. Love how versatile this recipe is! The sweating is key, right?! Such good texture! Glad you like them. Thanks for letting me know! This recipe is genius . . . buttery, comforting, creamy and nutty at the same time . . . delicious. My husband missed his noodles so much but liked these better than pasta! I’m a weight loss surgery patient, who was really looking to make my new pouch of a stomach feel better by not eating so many carbohydrates and saturated fat. I found your website and voila! I think I’ve found the answer. Of course, I’ll have to reduce the portion sizes, as I only eat about a 1/2 cup at a time, but I really think my surgeon would approve of this lifestyle! I’m excited to try these recipes..especially this one…I miss the pasta feeling I had before my surgery especially on cold winter nights…I’ll definately have to try this! Good luck to you! These noodles, in particular, are super easy on the digestive system, so this should be a good recipe for you. This looks awesome! But, I’m allergic to eggs. 🙁 What’s a girl to do? My first thought was tofu, but that’s not paleo. Thoughts? Shredded cooked chicken or diced cooked shrimp would work great instead of eggs. This sounds so delish! But I can’t find almond flour. any suggestions? The almond flour “breadcrumbs” are mostly for garnish — this is awesome without them, so if you can’t get your hands on almond flour, you an just skip that part. Or… you can get blanched almonds and grind them into dust in a food processor… instant almond flour. Just tried this recipe, and YUM! is all I can say! At last!! the julienne peeler! Th secret to making the zucchini noodles. I dont know how I missed this before, or in your book, but I will say that I am crazy happy to find this, and I am buying it right now this minute! I made this tonight… I think it might be my new favorite recipe of the moment and I fell in love with my julienne peeler! Julienne peeler is also currently my fave kitchen gadget. Glad you like the noodles! I made these noodles tonight they turned out FANTASTIC. Everyone in my family loved them. I don’t know how it is that they don’t taste at all like zucchini, but they really don’t. What’s equally amazing is that it gives me the comforting pasta feeling and tastes so good I don’t even miss cheese. I’ve made five things from your book so far and every single thing has turned out delicious and perfect. 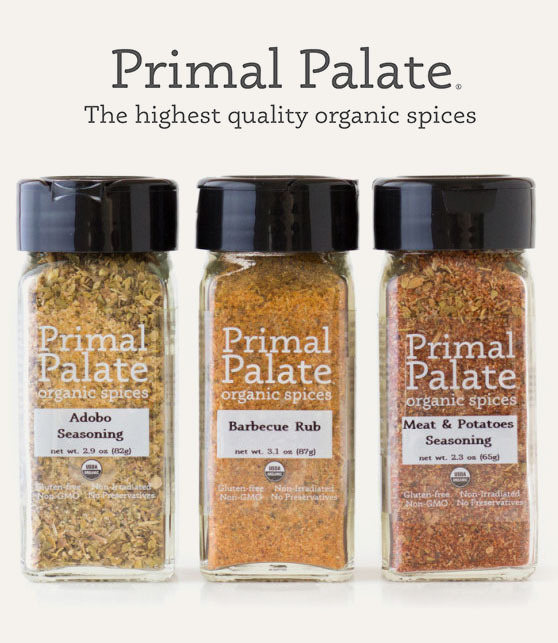 Thank you for making paleo eating interesting and easy. So glad you liked the noodles. Sneaky, right?! I don’t know how the zucchini does it, but I totally appreciate it. 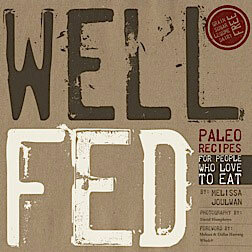 Thanks for the sweet words about Well Fed — great to know it’s helping you out. Happy cooking! This was so good. So, so good. I agree, everything I’ve made from your site has been FABULOUS! I’m going to order your cookbook!! Your recipes have saved me this past week. I made the comfort noodles when I was frustrated and wanted to give up on my whole30. They were indeed “comforting”, and I feel even better that I didn’t cave in to my cravings. Good for you! You are so much stronger than a craving… and I’m glad to know the zucchini noodles helped. Hang in there! You so got this. I made these tonight when I really needed some comfort food- this dish hit the spot! I love tucking into a bowl of noodles and used to eat tons of pasta before going mostly paleo. I used only 2 eggs but added some finely chopped leftover pork chop that I wanted to use up. The texture of the noodles cooked with the eggs is great- rich and warm without any of the normal offenders like dairy. Thank you! Awesome! So glad you liked them. They really do come in handy when you need that noodle comfort. Sundried tomatoes are a great addition. YUM! Oh, YUM. I just made these (first time I’ve used the julienne setting on my mandolin! ), and I thought I made enough for myself and my wife when she gets home later, but I accidentally ate both serves. Luckily I have more zucchini! Sounds amazing! Making this for sure. I am BEGGING you, please put a “post to pinterest” link on all your recipes! I’ve gotta be able to pin all these awesome recipes! They’re pure gold! I just purchased your book two days ago – AWESOME! I made your zucchini noodles for the first time tonight and topped it with sausage and peppers. Let me just say I’ll never eat pasta again! I can’t wait to try more! Oh, and I agree with Margaret about adding a link to Pintrest! I sweat my noodles in the oven at 200 degrees for a half hour. Works great every time. I’m curious… have you ever experimented with freezing the noodles after sweating but before cooking? Zucchini is at such a great price right now it would be a great time to stock the freezer. I just discovered your site a couple of weeks ago and am delighted. I was most interested in your zuccinni pasta. What a great idea. Last night I made “fried rice” using spaghetti squash, a 3 egg omelette, grean onion, garlic, ginger, soy sauce, fresh chives, s@p, and peas. My husband and I loved it. 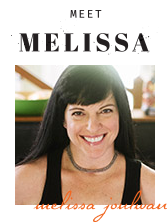 I thought, Melanie could make this truly Paleo and I’m betting it would be fantastic. Just a thought. Thank you for providing such a great site. I’m glad you found me! Your fried rice is totally paleo except for the soy sauce and the peas. Just replace the soy sauce with coconut aminos and use snow peas instead of green peas, and you’ll be in good shape! Hi Mel! I made this tonight for this second time, but with a little change. I used bacon and onion and made carbonara zucchini noodles, without dairy. It maybe one of the greatest things I’ve ever eaten. It’s downright decadent I have to thank you for your website and cookbook. I’m learning how to make things I can eat happily for the rest of my life. That sounds awesome! Really glad you’re having fun in the kitchen with my recipes. Wow! 3 things I have not done before – comment on a website, own a julienne peeler, make a recipe with zucchini. All the comments made me want to try it and they are right. This recipe is so simple and awesome! 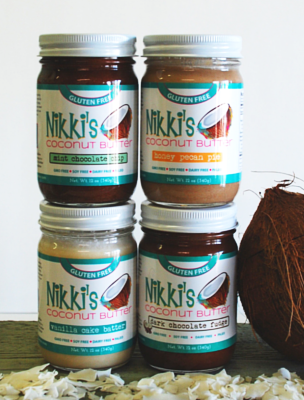 I added some almond butter and coconut aminos – my 16 yr old son gobbled the ‘pad thai’ down 🙂 Thanks for sharing. I’m honored to be the recipient of your first blog comment. YAY! Great recipe! Eating a big bowl right now, I used organic egg whites from a carton instead of whole eggs and ground up almonds in a coffee grinder instead of using flour, which made it a little pasty so will definitely use the flour next time. Thx! Having a hug in a bowl tonight for dinner for the first time. Can’t wait. BTW, saw the Gotham Girls beat LA Derby Dolls last night. First time I have seen live Roller Derby and it was awesome. Hooray on both counts! Hope you enjoyed the comfort noodles! Way back in the day, I had friends in both of those leagues — so fun! Just tried comfort noodles tonight. So yummy! I see all sorts of uses for the noodles. Thinking of adding lemon zest next time for some citrusy goodness. Thanks so much for this recipe! BTW…just found your blog and am loving it! I gave in to my Asian side and ate this with chopsticks and sriracha, and yes I do have sugar-free chili garlic sauce that I love, but sometimes you just need sriracha with your bowl of noodles. It was awesome. All hail the julienne peeler, right?! Zucchini noodles are magic! Just wait; you’re going to find all kinds of ways to use them. Glad you liked the recipe and had fun jazzin’ it up! This has become my fave! I like to add ground italian sausage flavored pork to it at times. So this may have been answered, I was prepping the noodles the night before for my lunch – instinct was to cook them and re heat. I don’t know what their shelf life is julienned and raw? Please advise. Oh, and YUM!! I sautéed mine with GF soy sauce and red pepper flakes. YUM. I usually julienne a big pile of zucchini, sweat it in a colander, rinse, pat dry, then put in a colander in the fridge uncovered for an hour. Then I put those noodles — which are nice and dry by then — into a covered container and store until I want to cook them. Sometimes you have to dry them off with a towel again before cooking. Mine keeps coming out delicious zucchini with scrambled eggs…. I think the eggs aren’t coming out right. Suggestions? Hmmm… without watching you in the kitchen, I’m not sure. It may be that you’re stirring too much? The eggs need to be able to set on the zucchini, instead of becoming curds. I’ll try that today. I stirred because it started to look like an omlette rather than egg battered zucchini. I think I need to reduce the amount of eggs used and make extra sure that i’m drying off the zucchini. they were tasty none-the-less haha! I am working my way through your cookbook. I made this recipe tonight (minus the egg) and it is amazing. I have had hypothyroidism treated with synthroid for about 10 years and you have helped me realize that I still don’t feel better (as weird as that might sound). Finally cut out gluten and now beginning my journey to feeling better. Paleo helps. Love you, love the blog and love the cookbook. Thanks!! Congratulations on cutting out the gluten — eating paleo definitely helps with thyroid nonsense. And I totally understand what yo mean about realizing you don’t feel better… “normal” can change,if you know what I mean. I am feeling pretty under the weather in the midst of my current whole thirty and I can’t imagine a more comforting meal. Thank you 🙂 My belly is happy even though my nose and head are not. Now off for a nap. I’m making a whole30 compliant version of spaghetti bolognaise tonight and can’t wait to use these in place of noodles! We can’t get enough of these zucchini noodles. They are awesome for dinner with shrimp or fish, or for breakfast with eggs coating the noodles. Yum! Love your book! Thank you! Just made this – turned out great! 4x the ingredients for dinner for me and my fiancé. I added some italian sausage on top which was better than I expected. This is our first non-breakfast paleo meal, thanks for helping make it a great one. I just made this for my partner and I, and we both just about had a foodgasm! My darling man, who is of the school of thought “yeah it’s yummy … but it’s healthy …”* (bless him), let out an exclamation of delight after his first mouthful (“this is DELICIOUS!”). A definite winner that will be going on my list of things to make again! The description “a hug in a bowl” could not possibly be more perfect – I want to hug YOU for inventing this recipe!!! *that said, he still eats everything I dish up, and given that I’m currently halfway through my first Whole30, he’s being fed a LOT of healthy foods! I just discovered a great time saver tip! Leave your zucchinis out overnight on the bench to allow any moisture to disperse. That’s what I did with mine last night, and this morning, when I julienned them, they were dry enough to sauté then and there without having to do the whole “sweat and rinse” process! (I make these noodles in big batches and have them for breakfast all week, so the sweating process used to take me AGES!). Pingback: Foodie Friday: Stop. Zucchini Time! I made these for breafast, oh man, just wonderful, such simple flavours, but hit the spot. I made with a potato peeler as I couldn’t wait for my julienne peeler to arrive and had them with pesto (also yours and crazy delicious). Thank you so much. Day 17 has just become the best day so far. I’ve made them that way, too… it’s like linguine. Yummy! Congratulations on Whole30-ing! Hope you’re starting to feel the awesome Whole30 magic. Thanks for commenting! I loved the sound of this recipe, but unfortunately I killed the zucchini… I’m trying to eat it now for the first time (cooked last night). It doesn’t look nearly as pretty as yours (more stringy/bent noodles), and they are SO SALTY.. I cannot eat them. :/ What did I do wrong? Added too much salt? I tried rinsing a lot and pushing the zucchini to try to get more water out. Without being in the kitchen with you, it’s impossible for me to know what happened. It’s possible you used to much salt, but the rinsing should have taken care of that. The type shouldn’t matter. Give it another shot with less salt… maybe try about 1/4 teaspoon per zucchini to start. I’m so glad you liked the Comfort Noodles — and good on you for not giving into the temptation of mac & cheese. Well done! I made these today after seeing them on your best of 2013 roundup. I was VERY skeptical to try them bc I just couldn’t wrap my brain around zucchini and eggs being that good together, and I was worried about it being watery. I gave it a shot since the reviews were so good. I LOVED them! I definitely did some slurping! My 4yo asked to try them and approved too! I will add these to my regular rotation! Up next is your chocolate chili! I’m glad you decided to take a chance on this recipe — and REALLY glad that you liked it! YAY! Thanks for letting me know it was a hit. Just made this and ate it all up. It’s so good, I wanted more, but now that 15 has passed I’m very satisfied. My six year old daughter liked this as well. Do you think it will re-heat okay? Congratulations on Whole30-ing! Glad my recipes are helping. Happy eating to you! These were so yummy! I was not sure I would like them, but they were great. My non Paleo husband even asked why I cheated and added cream to the noodles! I’m glad you took a chance on this recipe — and that you liked it. YAY! I made this with cauliflower and broccoli! Obviously, not noodly, but definitely delicious! I just added a couple splashes of water while the florets cooked–otherwise, same recipe, Yay for yummy lunch! Thanks Mel! Was I supposed to mix the coconut oil and almond meal together BEFORE I put it in the pan? I melted the coconut oil and then toasted the meal and made a nice little toasty crunch for the noodles, but didn’t look anything like the little nuggets in the picture above. Overall though? This recipe is getting flagged as a favorite! The trick to getting it to stick together is to mix the coconut oil and almond flour together first, then cook until it’s dried out and crisp. I made these today, so yummy. I am not a fan of eggs BUT I liked them in this. Thank you for sharing! On Day 12 of Whole30 and was looking to try something different. I am not a zucchini fan, but I absolutely loved your recipe. This is a definite keeper. Thank you. I just made these and they turned out more like scrambled eggs with zucchini. They definitely don’t look like the picture. 3 eggs seemed like a lot for the two zucchini I used. Less eggs or more zucchini next time maybe? Still tastes good but I’m saving it for breakfast tomorrow instead of using as a side dish like I’d hoped. Wow!! Just made this (literally – eating as I type) and they are FANTASTIC! I took the liberty of adding some prosciutto to give the dish a little carbonara feel – I think this may very well end up being a regular dish in my house! Thanks for sharing! I 100% endorse the addition of prosciutto! That sounds delicious. Glad you liked this recipe! Pingback: Foodie Flattery – “Comfort Noodles” from The Clothes Make The Girl | eat. write. run. repeat! I guess I messed these up. *tear* I used 3 farm eggs and I think they were way too big for my 2.5 c zoodles. Forgot to update…even though I did mess these up, they were still surprisingly delicious! Definitely will make these again with smaller eggs and/or more zucchini. Just made these with cabbage “noodles” because I can’t eat zucchini. Delicious! I added some bacon and it was like a lovely “cabbage carbonara”. Fast, easy, delicious? I’m sold! Um… that sounds AMAZINGLY delicious. I love cabbage, so I’m definitely going to have to try that combo! Surprisingly good! I expected a zucchini flavor but instead tasted the garlic, egg and olive oil, and the zucchini had a texture of rice noodles. Lots of opportunity for experimenting. Next time I might try toasting some slivered almonds instead of the almond flour/oil garnish as mine ended up more of a dark roux than crisp garnish. Might try a diced shallot instead of garlic next time. GOOD STUFF, MELISSA! I do not know why this works, but it does. I am pregnant and this has finally satisfied my finicky stomach. Thank you for the recipe! It works because it’s comforting 😉 Hugs to you and the baby-in-progress. I’m so glad you gave it a shot and liked it. YAY! Don’t you hate Sad Bowl Syndrome?! Does anyone know how well this saves for leftovers? Thinking it would be good for lunch but would need to made the night before? Thanks! I haven’t tried making them in advance. If you’re reheating them in the microwave, they might get watery. If you can make it, then reheat in a skillet, I think it should be just fine. Good luck! Something tells me this would actually taste awesome with firm, cold noodles as long as the seasoning and spicing is to your heart’s content. I plan on finding out in the next few days. I’m definitely going to try this tonight and am more confident now that I won’t lacerate my fingers! Would a dash of coconut aminos or approved fish sauce be ok in it? Rather than throw away the core though, I’d freeze it with my other vegie peelings to make concentrated vegie stock. Then I compost all the cooked up goosh. I think a splash of either of those would be tasty. I discovered you a couple days ago and can’t get enough. My sweetie and I are doing Whole30. You are saving us. Thank you. Hey, I have had made zoodles before but not like this. Your recipe really did make them amazingly delicious. However my almond meal breadcrumbs didn’t work. The mix just wouldn’t clump together and I ended up with toasted almond meal instead of the almost granola style chunks you have. Any tips? Without being in the kitchen with you while you’re cooking, there’s no way for me to know what the issue might be. Next time, try pushing all of the almond flour mixture together in a clump, then let it cool, and break it up. As it cools, the fat should solidify and make chunks, rather than individual grains of almond flour. I usually salt the zucchini and leave for 1-2 mins then sqeeeeeze the water out: no need to wait 20 mins for it to drain itself. I’ve found this to be 100% as effective. I also often double the garlic in this recipe, although I do reeealy love garlic, so this may not be for everyone 🙂 You may need to fry it for a smidge longer to cut the strength a little, depending on your tastes. Also, rather than scrambling the eggs in one part of the pan first, I recommend mixing the egg through the noodles immediately and then cooking it slooowly over a very low heat–I tend to lift the pan right off half the time. It still cooks in minutes and the result is creamy and carbonara-like. 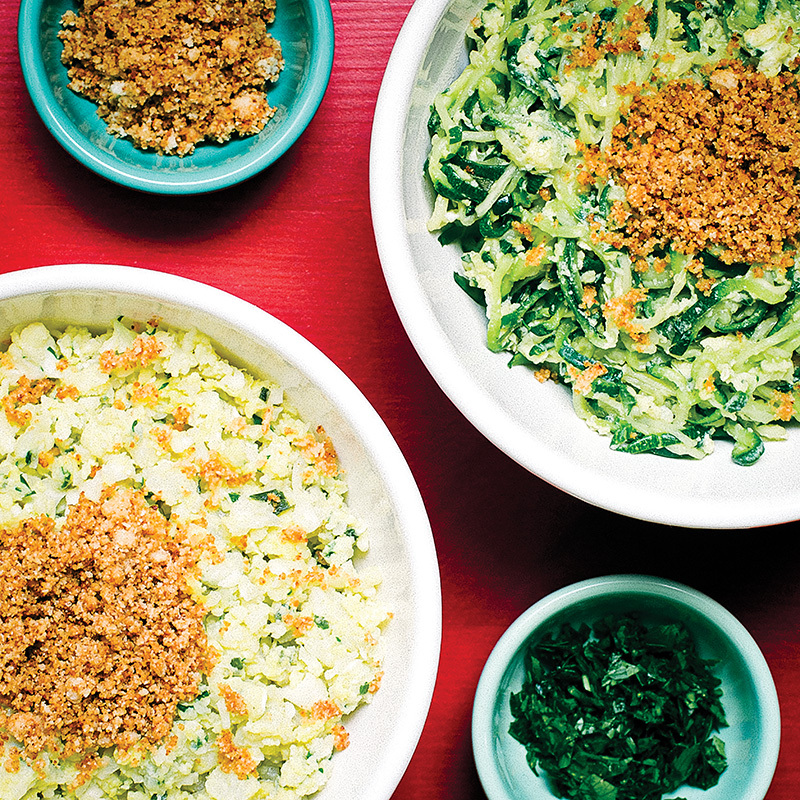 Other topping ideas: Parmesan, parsley, nutritional yeast, crispy bacon bits, or actual breadcrumbs if you can eat them; The Kitchn has a great recipe called “Poor Man’s Parmesan” you should try. And of course loads of black pepper! Yum. I added toasted coconut and raw goat’s milk feta to the original recipe. Scrumptious! You are the best! Not just for posting what sounds like an amazing recipe (my favorite comfort food recipe was spaghetti with butter and garlic), but also for posting an easier way to make zucchini pasta. I’ve been looking at spiralizers, but they seem to be so expensive. I tried to use my mandolin to do it, and it was bad. I’m trying to do the Whole30 on a very tight budget and was wanting to do noodles, but just couldn’t spend 30+ on a spiralizer. I can do $10 for a peeler though! Thank you! The peelers work great! Happy noodling! I just made this and it is AMAZING. I am the worst cook in the world but your recipes are so clear and easy to follow and everything I’ve made of yours has turned out so good! Hooray! Glad you liked it! And I don’t believe you’re a bad cook… that’s just silly talk. You just need the right recipes 🙂 Happy new year! Whenever I come across a vegetable I think I wont like, I find a recipe written by you and suddenly it makes me want to try it. I am now a huge fan of zucchini noodles and spaghetti squash. Thanks! That’s awesome! I feel like I need to do more unusual veggies recipes RIGHT NOW! Happy veggies to you! This is not a combo I would ever come up with on my own, but I trust your creativity now and how could I resist a comfort food. I made it last night, and the recipe is a keeper. Though I had to laugh, in the past comfort food was reserved for sick days. Now on paleo/whole foods, I never get sick. So, I guess I will make this on days I need “happy” food. I’m glad you decided to give it a try! Paleo comfort food *is* happy food!? YAY! I’m glad you enjoyed the noodles — and thanks for the sweet compliment. I’m growing my hair and experimenting with a side part, so the kind words are much appreciated. I made those noodles yesterday night and subbed hemp hearts for almonds due to allergies. It all worked and was very delicious.